Chesapeake Childrens Museum founder Debbie Wood, center, gardens with Broadneck High schoolers Alice Elkin and Sarah Hope. Sometime during the unsteady month of April, a certain magic touches gardeners. A bit of warmth to the breeze, the nudge of a tender shoot awakened from its winter dormancy, the sweet smell of spring: All push us toward our garden beds, where the need to clear away anything brown becomes overwhelming. For the secret garden is waiting there to break forth and usher in the springtime. For some, gardening is a creative outlet, for others a form of exercise. For still others it is an escape from the stresses of the day. For many in Annapolis, gardening is more than an escape; it is a GreenScape. "Just look how they've grown." Jan Hardesty seems wonder-filled as she walks me through the GreenScape at Maryland Hall for the Creative Arts. "These magnolias were planted just five years ago, from tiny twigs," she says, "and just look how they've grown." Her beautiful garden, planted in memory of her mother who died of cancer, seems to have grown entirely through love, since she claims to have known nothing of gardening when she began. "I learned it all by reading books. My mother and father both loved gardening." Each of her many Maryland Hall gardens has a theme: The rock garden, a favorite of her mother; the rose garden, planted to keep children from climbing the brick walls; the shade garden with redbuds and azaleas; the woodland garden, with many native plants like rhododendron, dogwood, swamp magnolias and fairy roses; and the herb garden with medicinal and culinary herbs used by Norm at the Café Beaux Arts in the basement of Maryland Hall. Hardesty - who has been a board member at Maryland Hall for more than a decade and was a founding organizer of GreenScape - takes obvious pleasure in the pleasure that her flowers and gardens give to others. Artists use her flowers and greens to decorate the Hall for Christmas, to fill vases and to inspire still-lifes in the art studios. Hardesty also appreciates the sense of community her gardens provide: "I can't tell you how many sprouts and cuttings have found their way into Murray Hill, or how many neighbors have stopped on their way through to tell me how much they appreciate seeing the color against that glorious old building." The bricks that Hardesty used to cover part of the walkways and to edge the garden beds were dug out of old Main Street. That a part of Main Street now supports the Maryland Hall GreenScape is fitting. GreenScape, after all, is about linking parts of the city together into one harmonious symphony of public gardens and green spaces. Jan Hardesty learned to garden by reading books. Now, artists use her Maryland Hall gardens as inspiration and subject. In 10 years: 2,500 volunteers, 900 trees, 350 community gardens, 75 new acres of community open space. Ten years ago, Annapolis City Alderwoman and former first lady Ellen Moyer had a dream. She dreamed of connecting Annapolis neighborhoods, schools, recreation and enrichment centers with all-purpose trails that could be made beautiful with gardens. Since she had no budget to make her dream a reality, she called upon friends and community volunteers, like Hardesty. 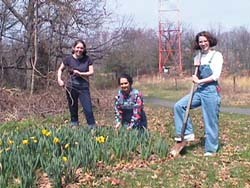 GreenScape was born on Earth Day 1992 as a city gardening crusade. The first GreenScape used donated planting materials, mulch scavenged from BG&E and volunteers primarily from the Naval Academy. This year's 10th annual GreenScape, on April 21, takes the theme of Communication and Outreach. Sharing the chair are Sandi Patty and Kate Meade, both employees of the Maryland Department of Natural Resources, though the DNR has no formal role in the now widespread city project. "Our goal is to involve as many people in this effort as possible," Patty says. "We are actively recruiting new participants. Greenscape offers any number of project ideas for Eagle Scout candidates or school community service volunteers. We can suggest projects, we can help coordinate volunteers, and we can even supply some materials. In the end it benefits us all." The only criteria for joining Annapolis' city GreenScape is that the garden be located on public land. Funds allocated by the city are divided up evenly among the teams. This year an all-time high of 55 teams have registered, and each team received $300. The city provides mulch and staff support from the departments of Recreation and Parks, Public Works and Planning and Zoning. Local businesses contribute gardening supplies, refreshments, technical skills and financial support. Gardeners choose from a list of plants provided by the City. These are distributed on April 20 for citywide planting on April 21. Also on April 20, past projects and plans for future GreenScapes are on exhibit at St. John's Boathouse from 6-8pm. In its 10-year history, GreenScape has planted over 350 community gardens, recruited over 2,500 volunteers, cleaned up over 75 acres of community open space, and planted over 900 trees and shrubs throughout Annapolis. This year, state agencies have joined the effort. Natural Resources and General Services (which take care of government buildings) are both starting big projects. Eastport Civic Association will be planting 18 gardens. To link gardens with environmental education, a massive garden is underway at the new site of the Chesapeake Children's Museum. 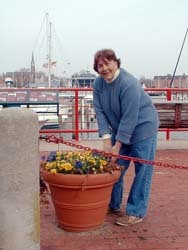 Ellen Moyer, a founder of G reenScape, at one of the Eastport street-end parks and one of the stops on the Eastport historical walking trail. "Kids love things that you can eat." If Jan Hardesty's GreenScape at Maryland Hall grows from love, Deborah Wood's will grow from dreams. Wood is the founding director of the Chesapeake Children's Museum, formerly housed at Festival Shopping Center on Riva Road. When the first part of the Annapolis Pathway opened, coincident with the first GreenScape in 1992, it traversed the head of Spa Creek by the old WYRE radio station building on Silopanna Road. 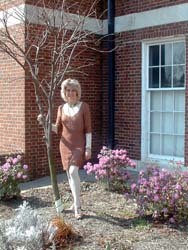 Now, through a two-year lease from the city, the WYRE building is where Wood has relocated all of the "stuff" of her museum which, since 1992, has brought programs about the Chesapeake Bay to children, as well as hosting parenting groups, workshops for Girl Scouts, art, music, storytelling and dance. But the Museum is in limbo, awaiting from the city a long-term lease that would allow for the necessary funds to refurbish the building and bring it up to safety code. So, with no opening date in sight, if kids can't come to the museum, Wood and volunteers take the museum to them through satellite programs, and the M.E.O.W. (Museum Education on Wheels) bus, which brings the museum to children in public housing communities of Annapolis. Reaching out to the community is such a big focus for the museum that their new location - adjacent to the Spa Creek Trail that connects to Maryland Hall, Bates Middle School, Weems Whalen Field and Truxtun Park - seems perfect. In faith that the long-term lease will become a reality, on April 21 Wood welcomes parents and kids, neighbors, Girl Scouts, midshipmen and high school students to come planting in the city-owned meadow at the head of Spa Creek. They'll plant blueberry and pawpaw bushes, purchased with GreenScape funds, because "kids love things that you can eat." Wood is also incorporating plants that represent groups within the local community, like Mexican hyssop "for memories of home for the Latino immigrant community" and echinacea and yarrow, which are traditional medicinal plants of Native Americans. 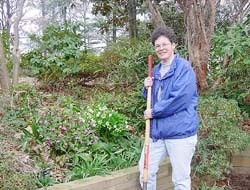 In the wooded area on the five-and-one-quarter-acre lot, she'll plant hostas and wood aster, along with a nature trail, to retain the natural quality of the native forest. A self-proclaimed dreamer, Wood walks with me to a wetland behind the radio building. Here she envisions an amphitheater and a place for kids to learn about decaying trees and rotting fungus. Over the marshland, she pictures a toddler-proof bridge for birdwatching, and at the head of Spa Creek she envisions a dock to connect kids from public housing communities to the museum by water. Anything seems possible, and I can't help but believe in the magic myself for, as we walk along the Spa Creek Trail, a bluebird flies out of the forest and lands on the path in front of us. "That has to be a good sign; I believe in omens," says Wood. 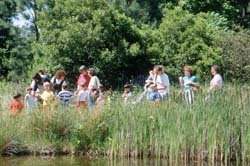 Families amble along a boardwalk through the Eastern Shore garden at the Helen Avalynne Tawes Gardens behind DNRs main offices in Annapolis. "Come, bring your gloves and your tools." Continue along the Spa Creek Trail to the Colonial Annapolis Maritime Trail to the Poplar Trail, and you'll find yourself in Germantown, where neighbors have been planting trees and shrubs together for years. Judy Dein of the Germantown-Homewood Association expects a large gathering on GreenScape day, when families, old folks, youngsters and even dogs will be helping plant redbuds, crab apples and flowers provided by city funds. "If they're old, they get to weed; if they're young they get to dig and mulch," says Dein. "Come, bring your gloves and your tools. It's going to be total mayhem." But the kind of mayhem that sounds like a lot of fun; the stuff that makes a community. Take the Maritime Trail to the south, and you might end up in Eastport, where at least 18 projects are being planned by community groups including the Eastport Civic Association, the Maritime Republic of Eastport and the Eastport Business Association. If you prefer walking to planting you can spend the whole day walking past GreenScapes and other city gardens. Two official walks are planned for GreenScape day. At 9am, group and individual Volksmarchs begins at Maryland Hall and take the Colonial Annapolis Maritime Trail to the Eastport Historic Trail. At 10am, a Founders' Walk starts at Poplar Park at Germantown, then picks up the Spa Creek Trail past Maryland Hall, the Children's Museum and Truxtun Park. "If you build it (or grow it) they will come." If you want to take a walk through Annapolis, take the Pathways. If you want to take a walk through Maryland, visit the Helen Avalynne Tawes Garden behind the Maryland Department of Natural Resources building on Taylor Avenue. Named for a former first lady of Maryland, the Tawes Garden, subtitled Maryland in Miniature, represents the geographic areas of our state in five delightful acres. Not a GreenScape garden, the Tawes Garden was created in the mid-'70s on what had been a flat cinder lot once housing the West Annapolis carnival. It speaks volumes about what can be done in an inner city space to provide restoration and education for citizens. The garden plan called for a barrier-free botanical garden featuring natural plants of Maryland. Ponds, earth mounds and pathways were constructed, leaves have been added as natural mulch and some trees and plants were added. Now the area is beginning to naturalize. Walking through the garden, it is easy to forget the busy highways on either side, or that one is in a city at all. Follow the path up a slight incline and there you are in Western Maryland. Here, says Don Myers, the man who has shared most of the garden's history, is where Tawes' Maryland in miniature began. From transplants, native sugar maples, black locust, hemlock, sweet birch, pin oak and aspen have grown into a forest. In the understory are spicebush, wild hydrangea and witch hazel. Christmas fern and Virginia creeper adorn the ground. Native plants don't need a lot of extra care once established. They thrive because the conditions they need are already there. Come down from the mountain and over a foot bridge and you are on Maryland's Eastern Shore. Loblolly pines and bayberry guide you to the sand dunes covered with rose mallow and beach grass, which stabilize the dunes in the midst of the destructive forces of wind and water. London Towns Director of Horticulture Mollie Ridout cultivates stinking hellebore, an early bloomer. "It's also okay to select out for desirable qualities." A pathway to the south of town and back in time leads to historic London Town on the South River. In the late 1600s and early 1700s, the town of London was a major tobacco exporting center. The London Town House, built around 1760 by William Brown, has been restored to reflect 18th century life, as have some of the gardens, such as the colonial kitchen garden and the medicinal garden. But gardener Mollie Ridout walked me through the 20th century woodland garden to show how native and exotic species sometimes mix for best results. Ridout, London Town's director of horticulture programs, loves to explain how plants from different locations around the world came together as new areas opened up to exploration by Europeans and later Americans in the 15th century and onward. The London Town garden grows companion species, like the native silky-camellia or Stewartia malachodendron, and its cousin from halfway around the world, Chinese stewartia. My favorite exotic was the stinking hellebore from Eastern Europe, whose Latin name, Hellebore foetidus, was no improvement on the English. Beautiful whitish-green flowers displayed over evergreen leaves that spread to provide a lovely groundcover. I also discovered the native pachysandra (P. procumbens), also known as Allegheny spurge, growing along with its cultivated English counterpart. Ridout showed me several hybrids of natives and non-native plants, explaining that sometimes plants are crossed for disease resistance, like the Rutgers dogwood, a hybrid of native and Chinese varieties resistant to the disease anthracnose, which has been affecting native trees. "It's also okay to select out for desirable qualities," Ridout assures me, showing off the Firecracker witch hazel, a feisty-looking cross between native and Asian species. We walk through the Azalea Glade, with native species on the right and hybrid species on the left of the trail. Ridout apologizes for the display of the 17 native species. Being deciduous, they don't look like much in March. But, in spite of her defense of exotics, her true loyalties show through here. "What I love about them is their colors," which she calls, "sherbet pastels." They'll bloom later this month through June. These eight acres of woodland gardens at London Town were developed in the 1970s by horticultural professors and graduate students from the University of Maryland, and they were planted by professional and amateur gardeners, area garden clubs and the county Recreation and Parks Department, which manages the property along with the London Town Foundation. The woodland setting means lots of shade and requires a rich, humusy soil. How do you get a humusy soil? Rideout's response: "Compost like crazy." Don't ever put your leaves out with the trash. She added that you can get a free composting bin at the Millersville Landfill in Severn. So, the lessons learned for growing a Chesapeake garden are much like the lessons learned for living a good life. Dream big. Add a lot of love. Bring together good friends. Follow the example of the natives but don't be afraid to get a little exotic. To these I'd add faith because, sure enough, with good compost and some water, the shoots will burst forth. The flowers will bloom. Volunteer to plant or provide materials and technical skills on GreenScape day, April 21: Sandi Patty, 410/268-0834, or Lee Ann Bogan, director of Parks and Recreation, 410/263-7958. Group Volksmarch begins April 21 at 9am and 11am at Maryland Hall. Individuals may start between 8am and 1pm and finish by 4pm. The trail is 10k/6.2mile with a 5k/3.1mile option: Bob Schmick, 410/647-5919. Founders Walk: On April 21, GreenScape founders Ellen Moyer, Tawney Hamill (chair of the City Recreation Advisory Board) and Jan Hardesty lead a three-mile walk beginning at 10am at Poplar Park in Germantown: 410/269-6828. Identify your project. Start small. Work on large areas section by section. Let your ideas grow with your garden. Look around at what you like. Colorful beds? Defining shrubs? Raised beds? Rock or timbered terraces? Ornamental bushes? Go to garden shows, stroll through neighborhoods and public parks to get ideas. Talk to people whose gardens you admire. Draw a map to scale. Sketch in the structures that will define your garden (arbors, trellises, rocks, timbers, gravel, etc.). Add your plants and shrubs. If you keep to scale, you should be able to figure out just how much material you need, including mulch, compost and fertilizer. Water, weed, prune, deadhead and rake up debris. Try a garden anchored with flowering shrubs, defined with banks of perennials and kept colorful with beds of annuals. The shrubs and perennials will return year after year; the annuals can be mixed and matched every year and give the most consistent color throughout the season. Butterfly bushes: They become enormous, have a lengthy bloom season and come in beautiful colors. And yes, the butterflies flock to them. All species. If you plant only one thing in your yard, get a one-gallon butterfly bush. And step back. Quickly. Adkins Arboretum, Ridgely: A large arboretum of entirely native plants. Plant sales every spring and fall: 410/634-2847. Irvine Science Center, on Greenspring Ave. just north of the Baltimore Beltway. Many nurseries sell plants at their Native Plant Conference, every year in August: 410/484-2413 · www.explorenature.org. ·Lahr Symposium, annually in March at the National Arboretum, Washington. Nurseries sell plants at this event: : 202/245-4521. Lower Marlboro Nursery, Dunkirk. Specializes in native plants. Mary Stuart Sierra, proprietor: 301/812-0808 · [email protected]. London Town, Edgewater. Daily from late April to October; plant sale on the last Saturday of April every year: 410/222-1919. Maryland Cooperative Extension Service will send its brochure "Native Plants of Maryland: What, When and Where," for $3. Requests can be made at [email protected]. Maryland Native Plant Society, Silver Spring. Many lectures and guided walks of interesting natural areas. Their website - www.mdflora.org - lists native plants of Maryland.